Ever wanted to tailor your own software amp in a plug‑in, and pack the result into a box to take on stage with a real speaker? It’s only a year and a half since I reviewed Positive Grid’s 600W Bias Head modelling guitar amp and Bias Amp Professional amp‑design software, but the design team certainly haven’t been resting on their laurels — 2018 has seen the release not only of the Bias Mini Guitar and Bias Amp Pro 2, but also of Bias Amp Bass and Bias Amp 2 Mobile. The 2.36kg Bias Mini Guitar is well named, as it packs the same emulation engine and USB/wireless connectivity found in the Bias Amp and Bias Head into a smaller, yet simple‑to‑operate form factor. 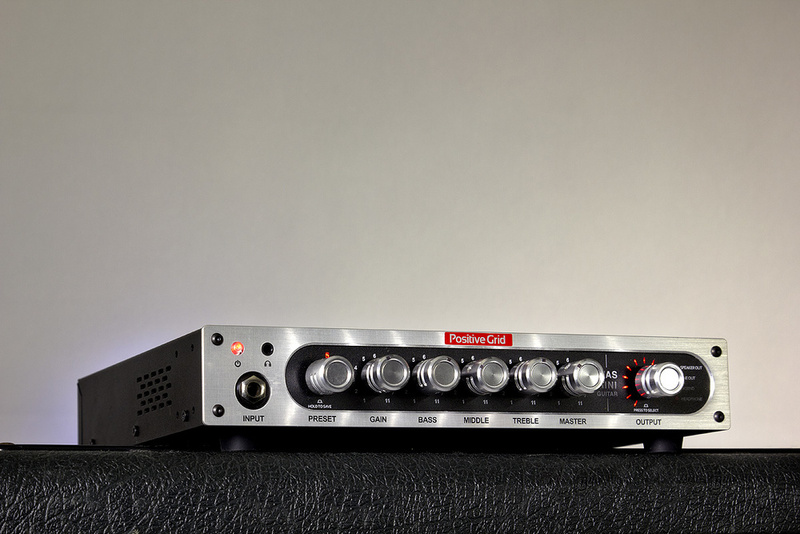 Its diminutive silver and black, 1U half‑rack fascia carries seven silver knobs (the Bias Rack has 14), a stereo headphone mini‑jack and a quarter‑inch TS jack mono instrument input, and the whole ensemble has more the appearance of a preamp than a full guitar amp — yet there’s a beefy 300W (into 4Ω) Class‑D power amp in this box. The detented, eight‑position preset selector manages access to the unit’s twin eight‑slot preset banks (giving the Mini 16 presets in total, compared with the Bias Head’s 25). There’s also a continuous Output level control, whose function can be switched across the Bias Mini’s four outputs (Speaker Out, Line Out, FX Send and Headphone output). But the five remaining knobs (Gain, Bass, Middle, Treble and Master) are instantly familiar. On the rear panel, you’ll find an IEC mains socket, a pair of quarter‑inch TRS jacks that carry the effects‑loop send and return plus a single one that allows you to plug in the optional four‑button, four‑preset select Bias footswitch. The Bias Mini’s MIDI I/O is via a pair of mini‑jacks (suitable DIN to mini‑jack adaptors are provided), the 4‑16 Ω speaker output is carried by a red‑collared quarter‑inch TS jack and an XLR with ground‑lift that delivers the DI output. The manual notes that connecting this DI output to a microphone input with phantom power may cause damage to the Bias Mini, thereby implying that the Bias Mini’s DI output has not been designed to deal with phantom power. This — and the lack of warning on the device itself — disappointed me, since many mixers and audio interfaces supply only phantom power that is only switchable globally; it may be an idea to budget for a decent DI box or an isolating unit to keep phantom power at bay. Lastly, a USB Type‑B connector allows direct connection of the Bias Mini to a desktop computer, and a blue‑illuminated switch initiates Bluetooth pairing with an iPad running the Bias Amp 2 software. Bluetooth is disabled when the USB connection is in use. The Bias Mini Guitar features both line‑ and speaker‑level outputs, allowing you to hook it up to a PA or a recording system and drive a speaker cabinet simultaneously. As with the Bias Head, you could simply treat the Bias Mini as a stand‑alone, 16‑preset modelling amplifier, but you’d miss out on the power of Positive Grid’s Bias Amp 2 Pro amplifier design software, which can be run stand‑alone or as a VST/AU plug‑in on Windows and Mac platforms. The software is available to buy separately, but a free licence is included as part of the Bias Mini Guitar package. 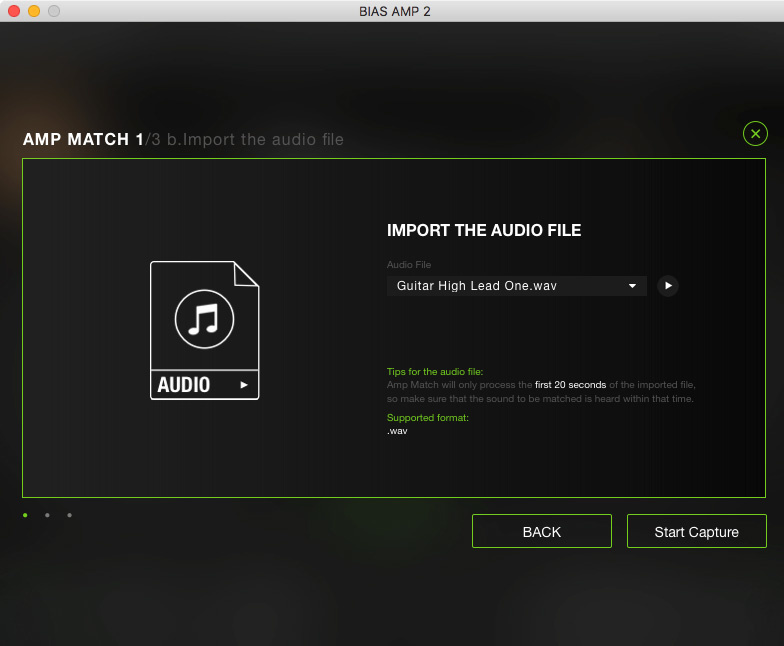 Since I went through the original version of the Bias Amp Pro software in depth in my March 2017 review, rather than revisit all that detail I’ll concentrate on the new features here. A new feature in Amp 2 Pro emulates the dynamic effect that power supplies and transformers have on a tube amp. In brief, the original Bias Amp was an amp design software that allowed you to set up a modelled amp’s appearance, preamp, tone stack, power amp, output transformer and cabinet. In the preamp you could set not only the number and type of tubes, but also their gain, distortion, frequency response and bias, and apply pre‑ and post‑EQ. The tone stack could be pre‑EQ’d, and there was a choice of easily identifiable stacks to choose from. In the power amp, there was a choice of familiar power‑amp topologies to tweak to your needs. Those fed an output transformer section and you were given a selection of speaker cabinets and microphones to choose from to capture the sound of the amplifier you’d created. You could then store the result as a preset. On top of all that, Bias Amp’s Amp Match feature allowed you to capture the sound of your own amplifier, you could load third‑party cabinet impulse responses, and the Positive Grid Tonecloud gave you access to a universe of Amp Match and custom amp presets created by both amateur and professional guitarists. Bias Amp 2, of which there are three variants — Standard, Pro and Elite — is more evolution than revolution. All three versions benefit from Positive Grid’s new Dynamic Tone Engine, which is designed to further enhance the software’s touch‑responsiveness and dynamics by deploying additional tube types in the preamp (12BH7 and 12AY7) and the power amp (6550 and KT88). Alongside these enhancements, a new Dynamic Tone Control (DTC) in the transformer stage emulates the dynamic effect that power supplies and transformers have on a tube amplifier’s upper mid‑range frequency response, and a completely redesigned speaker cabinet module with multi‑mic and open/closed‑back capability expands the tonal possibilities in Bias Amp 2. A new RTA (real‑time analyser) is also provided for those times you’d like to see what you think you’re hearing. 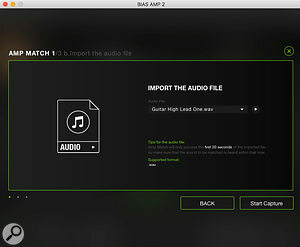 Positive Grid’s Amp Match technology can now be used with a 20‑second (plus), pre‑recorded audio file.To this enhanced Bias Amp 2 emulation engine, the Pro package adds a new and improved Amp Match facility that’s capable of matching the tone not only from a miked‑up guitar amp (as before), but also from the first 20 seconds of an audio file of a solo guitar/amp performance. Just in case you’re short of amps to choose from, Bias Amp 2 Pro comes complete with 100 new Amp Match presets sampled by Positive Grid from some extremely tasty tube amps and cabinets, plus the Blues and Bass preset expansion packs. The IR loader and file manager in Bias Amp 2 Pro has also been redesigned to make preset management easier. Positive Grid have also linked up with Celestion to add two officially sampled loudspeaker cabinets — loaded with a Creamback and a G12‑75 respectively — to Bias Amp 2 Pro’s factory IR lineup. This inter‑company cooperation also gives Bias Amp 2 Elite users access to an additional 15 official Celestion loudspeaker cabinet IRs (in 1x12, 2x12 and 4x12 form factors) based on Blue, G12‑65, G12H Anniversary, G12M Greenback and Vintage 30 drivers. Because of the Bias Mini Guitar’s more restricted complement of onboard performance parameter controls (preset store/recall, gain, bass, middle, treble, master volume and level control for the hardware outputs), unless you use an iPod or laptop with Bias Amp 2 Pro when playing live you’ll need a MIDI controller to be able to adjust the mix and overall level of the cabinet microphones, the reverb type and parameters and the operation of the noise gate on the fly. The Bias Mini Guitar’s Master control not only sets the signal level going into the power‑amp stage, but also has an effect on the amount of output tube distortion within it, opening up the way for a Gain/Master preamp/power‑amp distortion balancing act, which could result in the unit’s hardware outputs (which are not stored as part of a preset) changing levels between patches. Fortunately, the Bias Mini’s MIDI implementation also allows control of the levels of the individual outputs so, again, a MIDI controller (for example an effects floorboard with a couple of expression pedals) could come in handy. Just like a ‘real’ amp head, the Bias Mini worked well with pedals both in front of it and inserted into its serial, post tone‑stack, effects loop. Playing the Bias Mini head both via its DI into my DAW and monitors, and through 1x12 and 2x12 cabs with its cabinet emulation switched off, was an extremely enjoyable and musically satisfying experience. Even with the usual caveat that a modelled amplifier is basically a ‘recording’ of the real thing, playing through the Bias Mini into a real guitar cab gets so close to the feel of a real tube amp that only nostalgia — not necessity — would have me loading a vintage valve amp into my car for a gig. Good though the Bias Mini Guitar hardware is, the new enhancements to the Bias Amp Pro 2 software have really added to the authenticity of the original version’s playing experience, so for those planning on recording direct to a computer, or into reamping, it’s well worth noting that the software is available separately. Amp 2 Pro’s power‑tube options.I was impressed by the sounds from the new preamp and output tubes. The 12AY7 is a long‑time, low‑gain, high‑headroom preamp favourite and the 12BH7, which has similar properties, has become more popular in recent times both in preamp stages and as a single‑tube push‑pull output stage. The 6550 and KT88 have long and illustrious careers in the push‑pull power stages of guitar amps, where their sheer power makes them ideal for use in situations requiring clarity, high‑headroom and extended frequency response. The new Dynamic Tone Control, together with Cabinet module’s new dual‑microphone and open‑ or closed‑back options, open up another level of creative control and overall authenticity, although the lack of a spring emulation in the reverb module is rather curious. 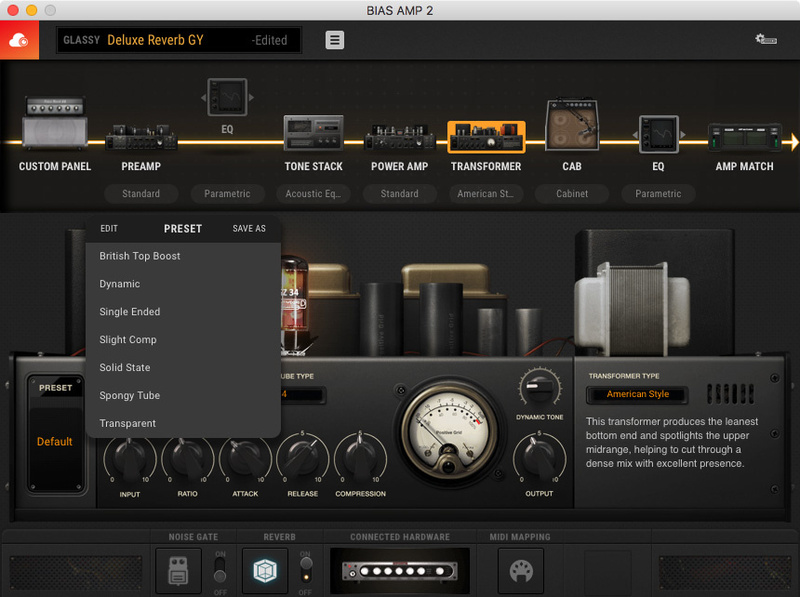 Compared with the original Bias Amp Pro software, the Bias Amp 2 Pro delivers an improved level of reality in its playing experience. Although the program certainly repays time spent in the detailed editing of each module (trust me, you can spend an inordinate amount of time doing this! ), the factory presets, and in particular the 100 new Amp Match presets that are part of Bias Amp Pro 2, are extremely impressive as they are — and that’s before you consider the stash of presets to explore on the Tonecloud. When it comes to emulated tube guitar amps, we’ve reached a point in time where your own taste, circumstances and requirements, rather than technical and performance factors, will determine whether or not you go with a real amplifier or a modelled equivalent. In my original review, I concluded that the Bias Head and original Bias Pro software combination ticked more boxes for me than any other modeller I’d tried at that time, and that conclusion has to be updated to include the Bias Mini Guitar and Bias Amp 2 Pro. 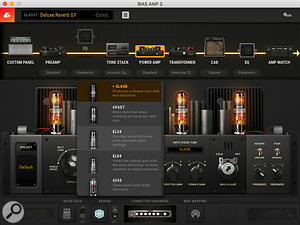 Although you can use this hardware/software combination to closely approximate the sound and experience of playing through a particular tube guitar amplifier, the real strength of Bias Amp Pro 2 is that it enables you to create an amp emulation tailored specifically to your requirements, and can load the result into the Bias Mini or your DAW software, making it incredibly versatile — and extremely convincing — whether live on stage or tweaking in the studio. Alternatives to the Bias Mini Guitar include the Line 6 Helix LT and the Boss GT‑1000 guitar processors, both of which offer similar functionality and include a large selection of effects. Excellent build quality and audio performance. Factory amplifier models sound good out of the box. Detailed preset optimisation enables the Bias Amp Mini to deliver a very convincing playing experience. 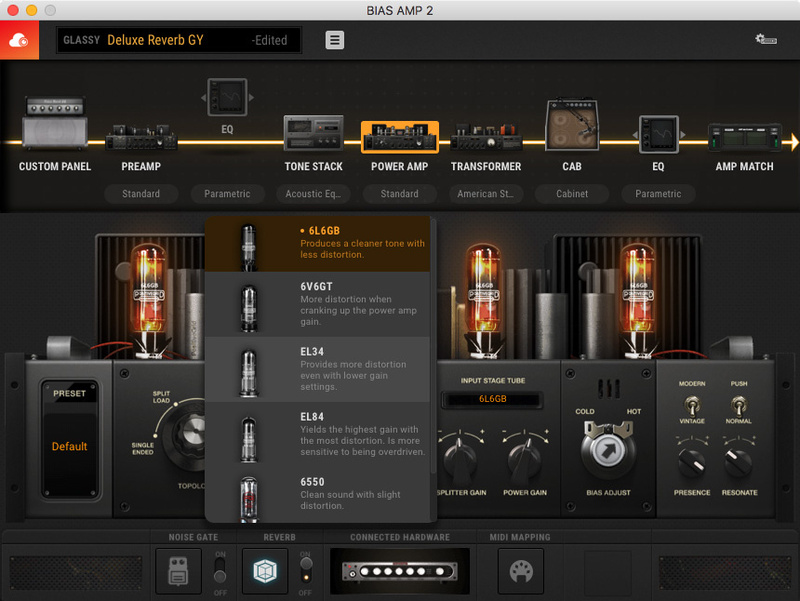 Bias Amp 2 can run stand‑alone or as an AU/VST plug‑in. Despite the Bias Amp 2 Pro’s complexity, creating and editing presets remains very intuitive. More onboard effects, including a spring reverb, would be nice. A powerful combination of a 300W Class‑D modelling guitar amplifier and highly detailed, stand‑alone or plug‑in amplifier design software, Positive Grid’s Bias Mini Guitar and Bias Amp 2 Pro are capable of delivering extremely convincing emulations of real tube guitar amplifiers, of matching the tone of any amplifier, and of allowing you to create the amplifier sounds of your dreams from scratch. Bias Mini Guitar (includes Bias Amp 2 Pro software) £701.34 (retail price, checked with Guitar Guitar via phone — MH); Bias Amp 2 Pro Desktop £199; Bias Amp 2 Mobile for iPad $19.99. Prices include VAT. Bias Mini Guitar (includes Bias Amp 2 Pro software) $799 (Sweetwater price — MH); Bias Amp 2 Pro Desktop $199; Bias Amp 2 Mobile for iPad $19.99.